There is something weirdly nerdy and exciting about a laser pointer, more so as a kid. Yes, you can really hurt somebody’s eyes if you point it in the wrong direction, and there is the age old myth of taking pilot’s eyes out by pointing a laser at them while they are flying planes, but there definitely is something in it. Or perhaps, it is just the 80s obsession with everything firing lasers and destroying things. World has moved on from the 80s though, and now laser pointers not only let you point at things such as presentations, but also let you control your presentation, go through slides, and click through links. 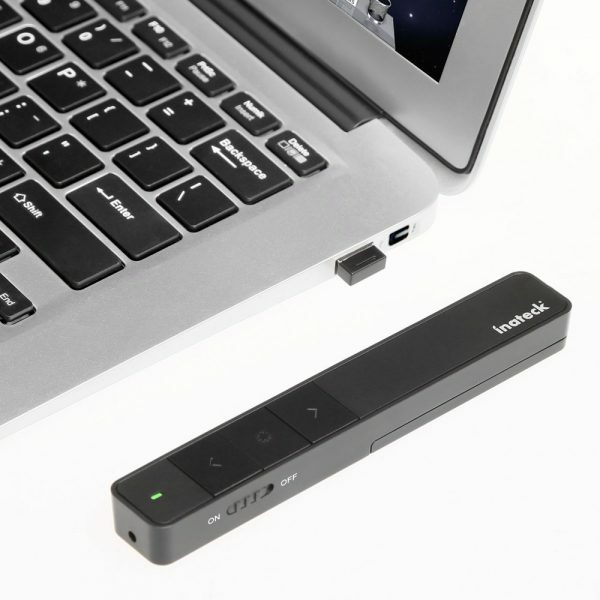 Inateck’s Wireless Presenter is one such device. The construction is fairly simple, with it being like one small and thin long brick. ABS plastic build means it is comfortable and nice to hold, and is very light. A bunch of buttons around it lets you control the unit. 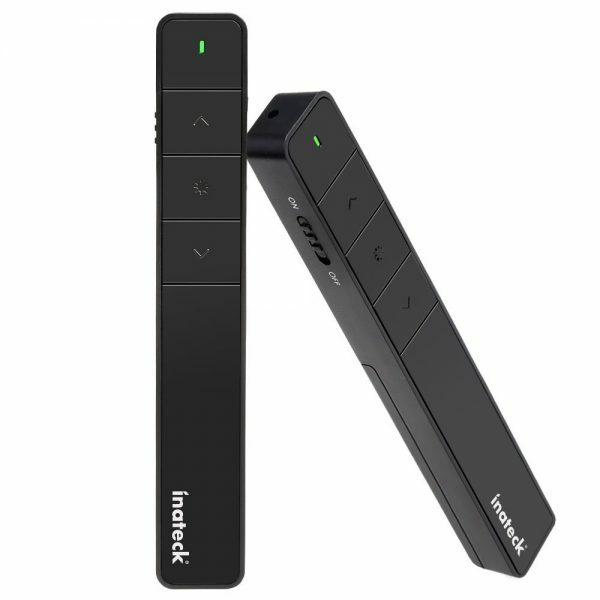 With features such as slide up and down, ability to select and open hyperlinks, as well as power it on and off, you have a good set of controls packed into this. On top of this, you obviously have the laser pointer, which lets you control the device. 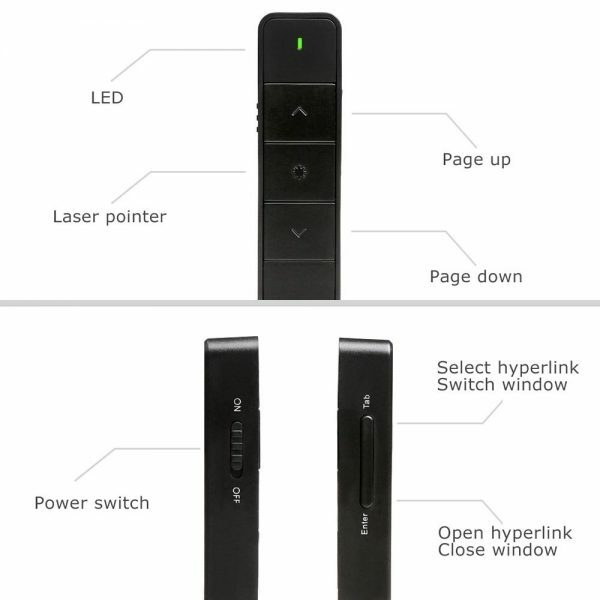 The device also includes an adapter that plugs into your computer to give you control. The device neatly fits in at the base, and has a magnetic clasp which holds it in place as you slide it in or out. Being tiny, it is one of those plug in and forget devices, but you may lose it if you go around giving presentations, so be careful! As far as computer installation goes, it is a pretty simple plug and play device, with no drivers required. It works for both PCs and Macs, so a wide variety of users are covered. No word is available on Linux compatibility. The laser itself is red, and works well over 20 meters away, though it is rated to work up to 200m. The pointer itself can be up to 30 meters away from the computer. It works on a AAA battery, and while I haven’t used it a lot, I imagine it should give you a decent life. It normally retails for £25.99, but is currently going for £12.99! The world of the pen pusher involves many presentations these days, and a device such as this is necessary for everyone, specially at this price!